Fractal comes from the word "fracture." There are key points in the Fractal of Pi where it can fracture. 1/30/2009 2:02:05 PM Mountain TG:: second that, tough to do well in the afternoon when 3/4th of fractal completed in the morning. Have a good weekend. 1/30/2009 1:04:18 PM Mountain TG:: ahab, what do you mean by moneytide? there are lots of tides around here and lots of inversions of tides. 1/30/2009 12:37:35 PM Mountain TG:: Al, isn't today a two moon day, making it a bit more likely that downside fractal grid will complete. 1/30/2009 12:35:50 PM Mountain TG:: certified chaos trader (cct). Those who have taken Al's chaos courses. 1/30/2009 11:45:36 AM Mountain cgm:: what is cct room? 1/30/2009 11:09:16 AM Mountain ahab:: Jupiter sure looks to be important today. 1/30/2009 10:44:39 AM Mountain DPP:: Hi Al and welcome lerkers to the big Friday show. Al, agree with your email last week ... My pay me first rule is 1/3 to saveings, 1/3 to debt, and 1/3 for me. Keep up the good work! 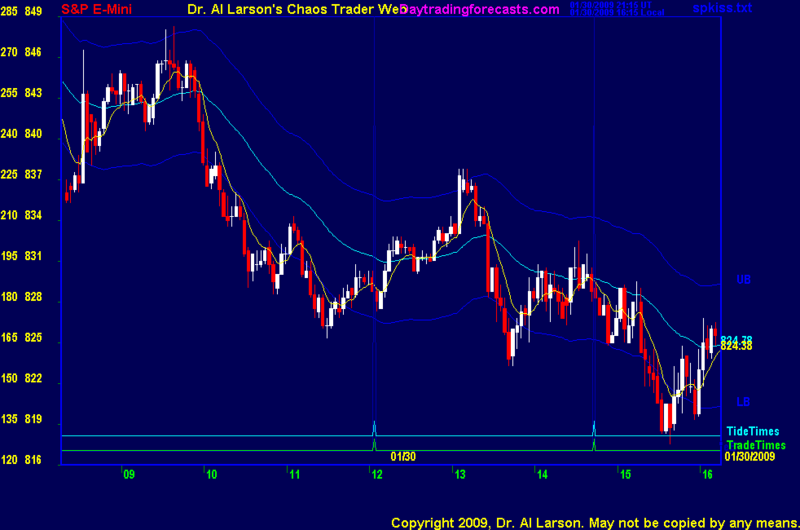 1/30/2009 10:32:22 AM Mountain sdg:: Hi Al, technically doji's represent indecision.